With 20th Century Fox’s Deadpool sucking out most of the air on Valentine’s Weekend 2016, most critics didn’t give this film a second look, which is extremely unfortunate. 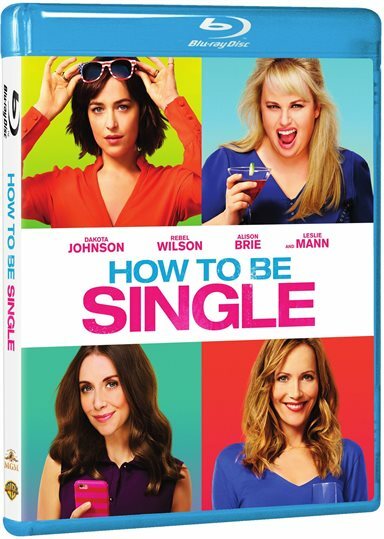 How to Be Single, the comedy starring Dakota Johnson (Fifty Shades of Gray), Rebel Wilson (Pitch Perfect), Leslie Mann (This Is 40) and Alison Brie (Community), makes its way to the home theater market this week with the release of the Blu-ray. Based on the book by Liz Tuccillo, How to Be Single focuses on four woman and their lives in the city that never sleeps. While some woman wait around to meet the perfect guy, or try to keep the man the man they have, Alice (Dakota Johnson) decides that even though she is in a relationship, she needs to find herself. After breaking up with her boyfriend Josh (Nicholas Braun; The Perks of Being a Wallflower ), she meets her co-worker, Robin (Rebel Wilson), who teaches her how to live her new single life. Conversely, Lucy (Alison Brie) is a woman who needs a boyfriend in her life so badly that she not only uses multiple dating sites to find a man, she came up with an algorithm to find a perfect match. Rounding out the cast is Leslie Mann's character, Meg, who is also Alice's older sister. She is a successful obstetrician who decides that she doesn't have the time to wait for the perfect man to show up in her life, and wants to have a baby now. After she gets pregnant however, a man enters her life. With 20th Century Fox's Deadpool sucking out most of the air on Valentine's Weekend 2016, most critics didn't give this film a second look, which is extremely unfortunate. The script by Abby Kohn and Marc Silverstein is quite well written. Fleshing out the four main characters and their quests to find their path in life. Unlike other films, director Christian Ditter (Love, Rosie), and producer Dana Fox (Ben and Kate) took suggestions and criticism from the cast throughout the filmmaking process improving the film along the way, making it a truly collaborative effort that shines through on the screen. Each character is fully fleshed out, showing every side of their personality and what makes them tick. Even the raunchy, care-free Robin (Rebel Wilson) proves by the end that she is more than meets the eye. Presented in 1080p AVC codec, How to Be Single shines through on Blu-ray. New York City is displayed in warm and crisp colors that help convey the city as caring and inviting. Blacks are spot on, as well as contrast. The lossless DTS-HD MA 5.1 soundtrack does a decent job with the audio. Dialog is concentrated on the center channel while the rest of the speakers are dedicated to background special effects. At no time was the dialog muddled. The Best Idea Wins! - The Humor of How to Be Single - A look into the creative process of making How to Be Single. Deleted Scenes - Various deleted scenes not included it the theatrical release. Rebel Wilson Outtakes - Crazy outtakes done by Rebel Wilson during production. When How To Be Single was originally released in theaters it was strategically done to be counter-programming to Deadpool for the Valentine Day weekend of 2016. However, it never took off as intended. Hopefully with the Blu-ray/Digital HD release the film will get the credit it deserves. Download How To Be Single from the iTunes Store in Digial HD. For more information about How To Be Single visit the FlickDirect Movie Database.